Will you pick Snot this Christmas with Smyths Toy Store? This year Smyths want you to head down to your local Smyths store and pick snot! Yep you heard me right, pick snot! But wait not all is at it seems, put away your tissues and the idea's of kids with bogeys its this adorable little fella called SNOT! 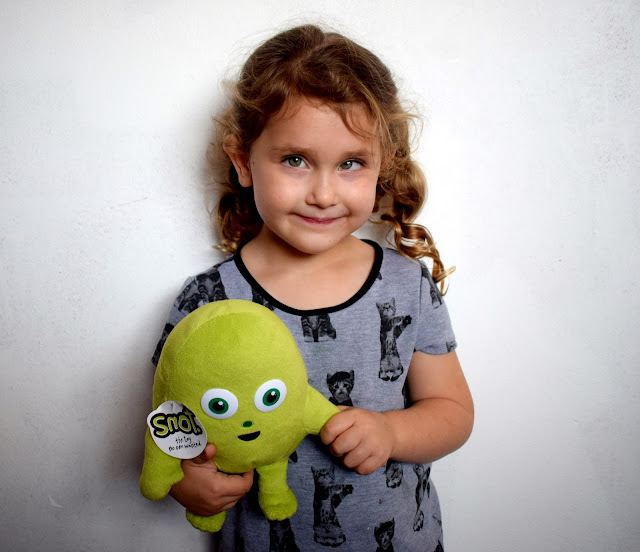 Smyths have realised this cute little plush called Snot and for every snot you pick and take home with you your helping other children too. That's because all profits made from the sale of Snot will go to Great Ormond Street Children's hospital. James and Evelyn thought the advert was absolutely hilarious and heart warming too, I mean what kid doesn't fall in love with a cuddly toy snot with eyes!? I have to admit I try to keep soft toys to a limit in our house but this one is a little different. I love the fact that not only do my children get a new cuddly toy but that I am also helping an amazing cause at Great Ormond street. Its so easy to get caught up in the excitement of Christmas but for some Christmas is a hard time especially for those with children who are poorly or sick and those who will spend Christmas inside a hospital ward or room. I think its fantastic that this Christmas Smyths gives us all the ability to help those people out with the simple purchase of snot, helping to create smiles all round this Christmas. Every day, 618 seriously ill children come to Great Ormond Street Hospital (GOSH) from right across the UK. These children are referred from their local hospital and seek specialist care. For some, GOSH represents their last hope. With your support, we can help provide a better future for these children and their families. Would you consider purchasing a snot toy for your kids this Christmas? Snot is available in all Smyths stores and costs just £9.99 which includes the Snot plush and book. You can also find the Snot book and even play the Snot game over on the Smyths website. My kids are so in love with snot, he's super cute and it's such a great cause isn't it? I have seen this Snot toy around. Looks fab. awww this looks like such a lovely toy... my little ones would love him too.